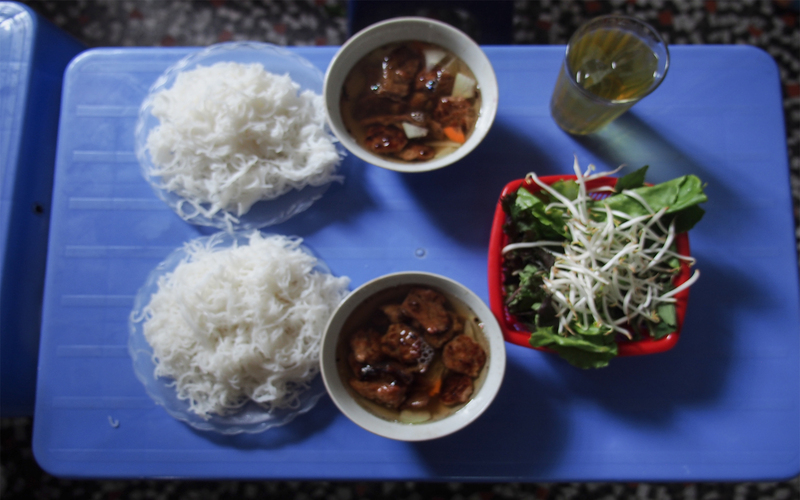 During four college years in Hanoi, I assumed I knew a good bun cha place when I saw one: blue plastic stools, sizzling pork on the sidewalk, thick smoke curling up, and inside, the sound of chomping mouths. Before college, I lived in my northern hometown where bun cha is nothing close to the original. As a first-timer, I embraced bun cha Hanoi with gratefulness and free of judgement, to start with. As the thrill gradually faded, I grew less random and a bit pickier. 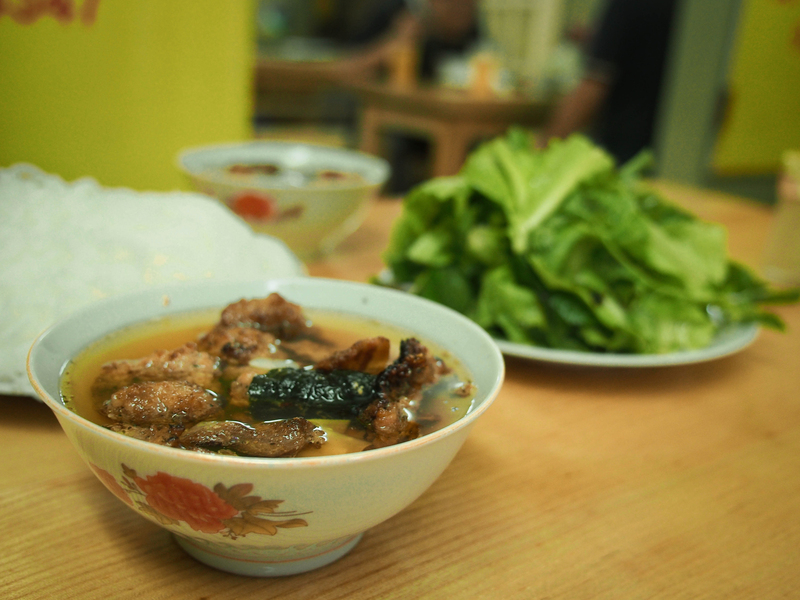 In Hanoi, once every few weeks food-rating apps would wax lyrical about some decades-old family bun cha legacy. I, like almost everyone, would rush to the new place, assuming olden is golden. In Hanoi, many family-run bun cha businesses date back to the forties and fifties, before the American War and the subsidy period. Around seven decades later, I can assure Mr. Bang some of the best have fallen far behind. 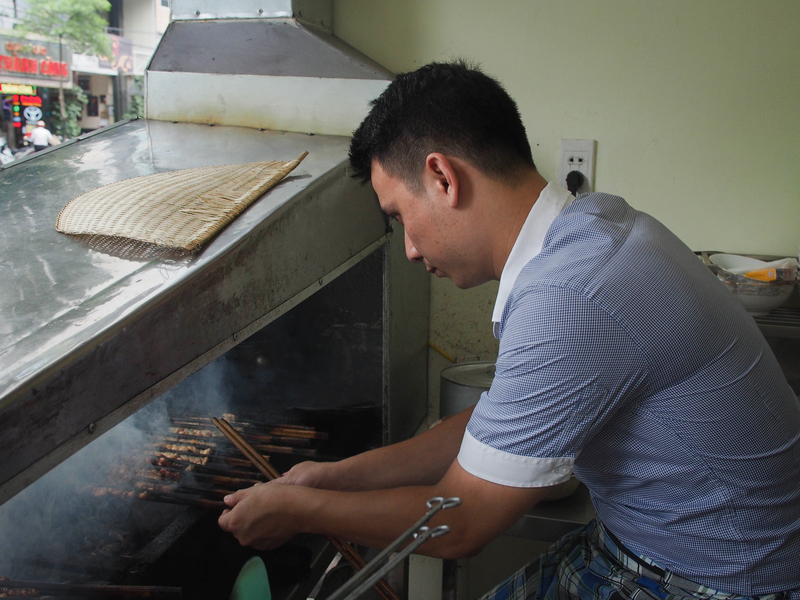 Last October, I visited a popular 40-year-old shop in the Old Quarter expecting the traditional method of grilling the meat in bamboo the food-rating apps had spoken of. What I found was a salty bowl full of charred meat. “My stall is too crowded from 11 a.m. to 2 p.m. How am I supposed to find the time for bamboo sticks?” said the owner, who inherited the business from her mother. 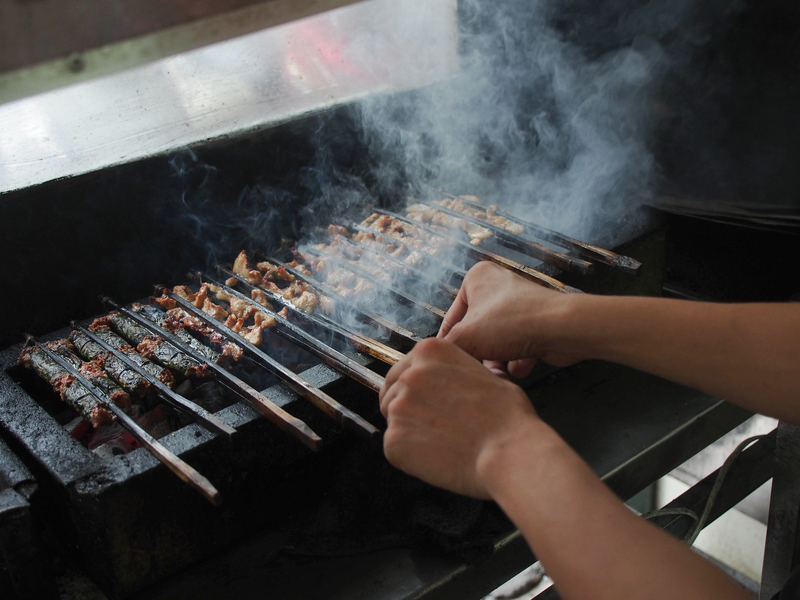 Like many stalls "burdened" by so many customers, the owner has chosen to switch from the traditional method of slow bamboo grilling to supercharged electric fans and metal grills. Indeed, after stopping by several popular bun cha spots, I was told the bamboo method did not make business sense, and that no one uses it any more. Yet mouth-watering paragraphs taken by Vu Bang and the lively reminiscing of Chef Nguyen Phuong Hai, an expert in traditional Hanoi cuisine, kept me hankering for what old Hanoians used to be so lucky to have. By my own standards, the dream bowl would look pleasant with a reasonable amount of cha evenly drenched in tasty sauce, leaving no piece cold, dry or stale on top. Bearing in mind all the criteria, I, resenting charred bits and bitterly salty sauce, was determined to find the perfect bowl. After over a dozen attempts in the past few months, I didn’t find just one, I found three. 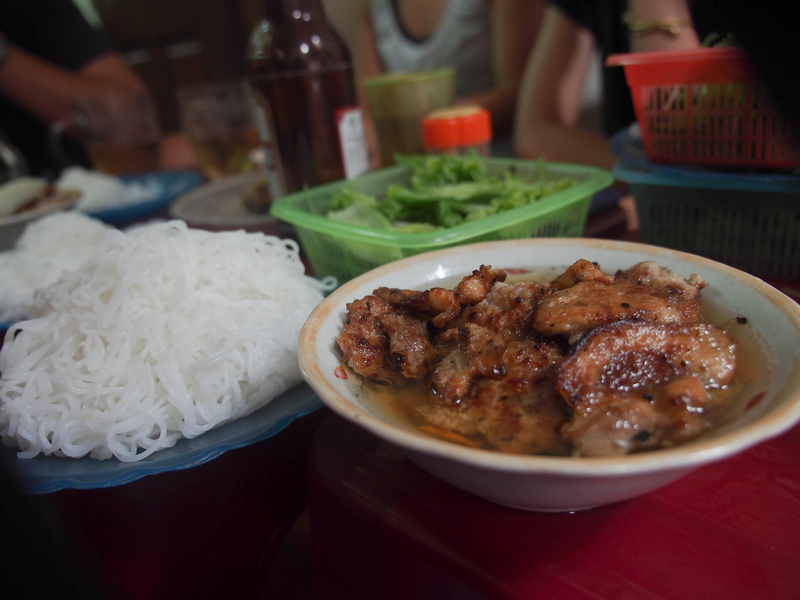 When former U.S. President Obama and food expert Anthony Bourdain shared a beer and a bowl of bun cha at Huong Lien’s restaurant last year, Bun cha Binh Chung wasn’t there on the same street. Just last month, the 71-year-old brand opened its second stall a block away from Huong Lien’s, which is now commonly known as “bun cha Obama”. Huan, 33, quit his job at a top Vietnamese telecoms firm to sell bun cha full-time. “Why work for someone else when you can have your own business?” Huan said, wearing a striped blue shirt and black trousers like he had just walked out of the office. Huan’s father was a bun cha junky and he himself spent much of his childhood fanning barbecues. His grandmother, Binh Chung, sold bun cha during the French assault known as Operation Lea in the forties and became known in Hanoi through the subsidy period. I wasn’t able to confirm whether that tale is true or not, but I know one thing for sure, it still uses the traditional bamboo grilling method I had been looking for. The best part? You can ask for the cha to be served separately from the sauce, just like old times, and it comes with a shrimp cake which goes perfectly with the sauce. 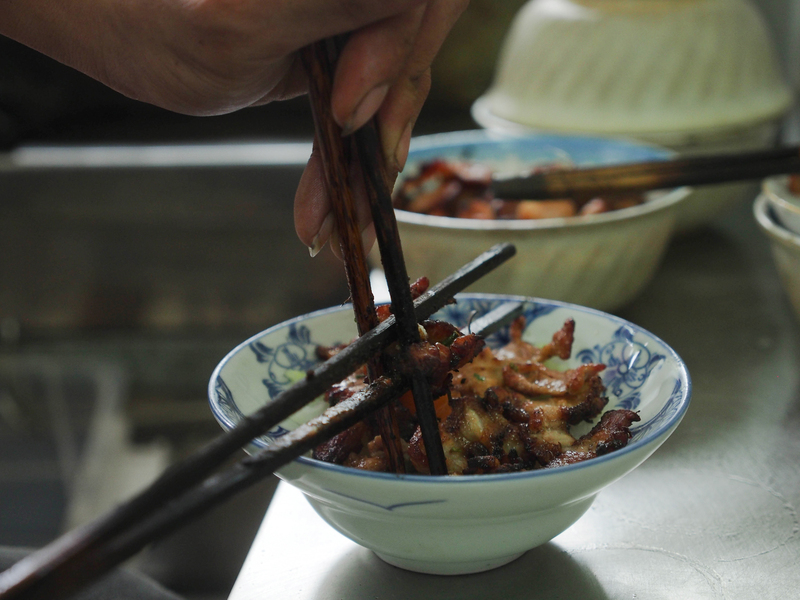 Huan serves four specialties: chopped pork wrapped in chapa leaves and grilled on bamboo sticks, pork belly, pork patties and the shrimp cake. I couldn’t decide for myself which was the best since they were all equally delicious, but the shrimp cake truly deserves a reward for creativity. I tried to keep an open mind on my search for the perfect bun cha, leaving out the family legacy factor, but I couldn't get over my own bias of expecting more from an old shop than a new one. That changed when I had lunch at Hong’s. 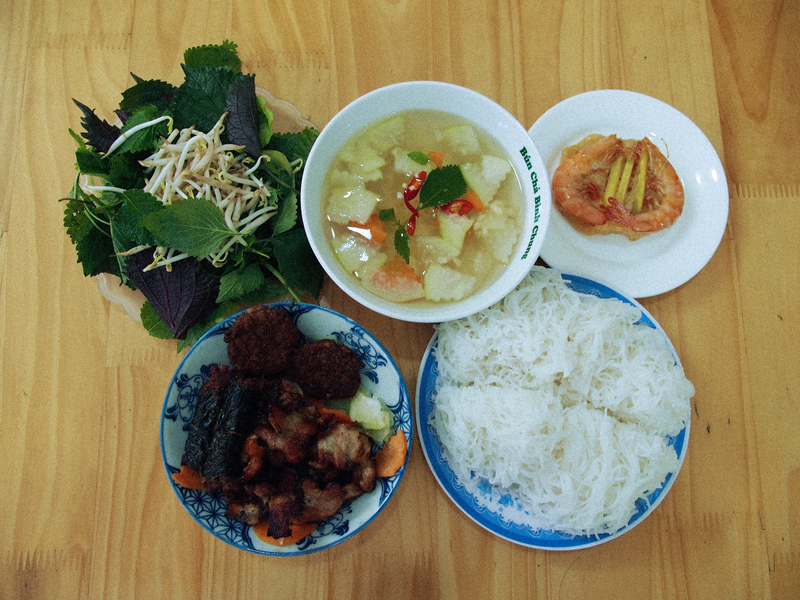 The shop is named quite simply after the dish: Bun cha nem ran. The number is 216, and it stands among dozens of other 216s due to the odd house-numbering in Vietnam. Yet inside, inviting bowls of bun cha are being served. Sizzling slices of chopped pork protrude just above the sauce. The bowl is elegant enough to not be mistaken for a bowl of pho, yet big enough for the cha to be fully immersed. Hong’s meal is minimalistic: just the golden, soft cha in a fresh, char-free sauce, with a snow-white dish of bun on the side. If you want a meal to brighten up your drowsy afternoon, find Hong sitting on a blue stool in front of a narrow, rustic door on Doi Can Street. Hang Manh Street in the Old Quarter was once famous for bamboo curtains (manh in Vietnamese) and bun cha. Each bun cha shop on the street took its owner's name, but always attached the street brand as a reminder of authenticity. Today, competition on Hang Manh is so fierce that some shops have put up signs bad-mouthing their rivals. Bun cha Hung Thai, originally located on Hang Manh Street, escaped the hustle, and now its owner Nguyen Van Hung has created a mini-empire just six kilometers from the Old Quarter. Hung oversees a total of four semi-detached shops and around 10 employees, all alert to any potential customers who pass by, not that there's much need. “We’re too busy already, no need to write about us,” shouted Hung’s wife, tending to four electric stoves that churn out hundreds of dishes each day. What could be more attractive than a shop that doesn't want more customers? Set a date for Bun Cha Hung Thai, but make sure you get there early to tuck into their freshest bites.